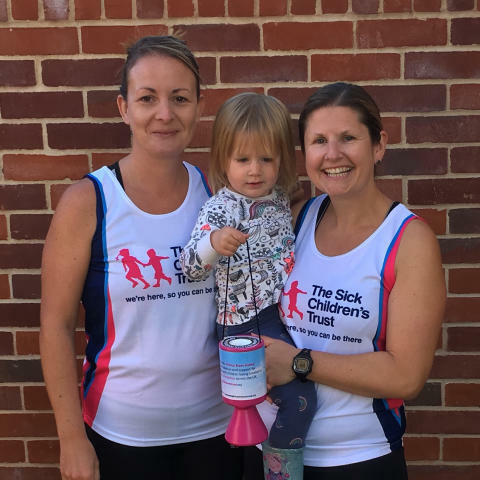 A local mum is running the Royal Parks Half Marathon on 14 October to raise money and awareness for The Sick Children’s Trust, a charity which supported her when her daughter required lifesaving treatment in a hospital far away from home. "I only saw Lily for a second after she was delivered because I had to go through recovery myself following such a difficult labour. Four hours later I was shown photos of my daughter by the midwife, but neither my husband Neil nor I realised the severity of her condition at that point. When I was finally able to visit her on NICU, I was distraught to see my baby covered in wires and hooked up to so many monitors. We were told she needed to be sent to Cambridge for lifesaving treatment. But I wasn’t ready to be discharged yet which meant my baby would have to travel there without me. I was heartbroken. "Fortunately I was discharged later on that evening and Neil and I raced to be with Lily. One of the nurses in Colchester had told us about The Sick Children's Trust in advance and explained that the charity ran free 'Home from Home' accommodation at The Rosie Hospital in Cambridge. She said they might have room for us which was just minutes from Lily's side. "That first night I was admitted to the hospital and Neil slept beside my hospital bed, but the next morning we were greeted by Abi, from The Sick Children's Trust. She offered us a room in Chestnut House, located just below NICU where Lily was being treated. Abi explained that the charity would support us, totally free of charge, keeping us right there next to our poorly baby. At such a traumatic time in our lives, this was a godsend." "I have wanted to raise money to say thank you to The Sick Children's Trust ever since they supported my family and now I finally feel ready. Before Lily was conceived I had registered to run my first ever half marathon, but had to stop training early on in my pregnancy. The Royal Parks Half Marathon seems like a perfect way to resume the challenge and at the same time raise both money and awareness for a charity close to all our hearts. Bev and I are training hard together and we’re hoping to complete it in two hours. Our target is £700, but we really hope to smash this figure and get to £1,000"
“It is terrifying for any parent when they have a seriously ill child in hospital and as a charity we hope to help as many families as possible during such difficult times. The Sick Children’s Trust relies entirely on voluntary donations so it means everything to us when families we have supported go on to fundraise for the charity. “I remember how distraught Paula and Neil were when I first met them on the ward and then showed them around Chestnut House. Lily made a very quick recovery, but it was still touch and go those first few days, which was frightening for her parents. We are so grateful to Paula and Bev for taking on the challenge and wish them the best of luck!"